(Reports | Sales | Sales by Customer Detail). 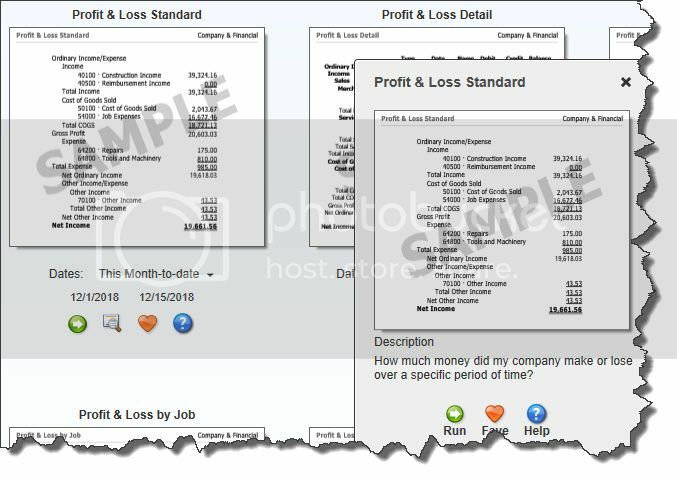 QuickBooks comes with a commonly-used set of default columns in its reports. This particular report contains column labels like Type (invoice, sales receipt, etc. ), Item and Quantity, and Sales Price. Filters. This is the difficult one — and the tool that will provide the most insight. Filters determine which subsets of related data you’ll see (accounts, items, customer types, zip codes, etc.) by including only those that meet certain conditions. Here’s where we can really help you answer critical business questions that will lead you to smart decisions. Well-formulated reports can help you spot cash flow problems, maintain the right inventory levels, see which jobs are the most profitable, and compare your estimates to actual costs. You’ll also be able to identify your best customers, your most sought-after items, and your most successful sales reps. Careful customization of your reports — and thorough analysis of their data — will make the answers to your constant questions about your company’s future direction much clearer. We can help you take full advantage of these powerful tools.